Woke up once again to sunshine & clear blue skies. I had a pleasant breakfast but I’m beginning to miss my fruit and kippers which seemed to have disappeared of the menu since leaving North Devon and St Ives. There have been a large number of landslides on the first part of the walk. 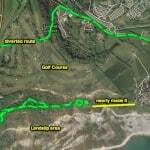 I thought I would explore the first one to see if there was a way through to Charmouth, As you can see from the GPS I nearly made it!, just defeated by a huge swamp. I would have thought a track could be cleared in a matter of days, the regular walkers would soon flatten it down. However, I guess we will have to wait a few years. So back I returned to face the long diversion along a road and through a golf course telling me to beware of flying balls, well it is mainly a man’s sport. The roller coaster continued today although it started to flatten out at the end when you have to walk alongside the gravel Chesil Beach. 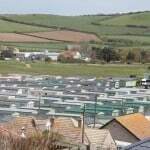 Once again there are some huge caravan parks despoiling the coastline. I was amazed that touring caravans are like £13,000, that’s a hell of a lot of nights in a b&b. The caravan parks reminded me of the vast plastic greenhouses we saw when Sally and I walked The Lycian Way. A lot of day walkers today, but no one particularly interesting one guy who was thinking about doing long walks, but I doubt if he will :-(. plus the usual number of dog walkers, it now seems you need two dogs. Everyone is kinda friendly here a lot more so than Cambridge where virtually no one says good morning to you. After wading through the stream at Burton Bradstock. I decided to walk the next couple of miles in bare feet, very easy it was too. It’s going to be quite tempting to do a lot more of it! certainly better than wearing out rubbish Scarpa Boots, and no that issue is still not resolved. The final few miles to Abbotsbury seemed to take ages. However as Mike had fixed me up at Peach’s B&B time didn’t matter 🙂 Peach’s is very pleasant and I managed to get onto their WiFi, which is just as well as T-Mobile doesn’t dain to serve this area. Then it was off to The Ilchester Arms for a great non-fish spread and listening to the locals going on about all the machinations the Navy are going through in these parts for the upcoming Olympics at Weymouth.